1Martynov MV, 1Maigurova NV, 1Pinigin GI. Astrometric binaries with invisible components in fields of the axial meridian circle of the Nikolaev Observatory. Ukrainian. 2013 ;29(5):75-0. 1Fis MM, 1Zazuliak PM, 1Cherniaha PH. The value and variations of density in mass centres of ellipsoidal planets. Ukrainian. 2013 ;29(2):62-68. 1Maigurova NV, 1Martynov MV, 1Pinigin GI. A star catalogue in fields of the axial meridian circle of the Nikolaev Observatory. Russian. 2013 ;29(1):68-0. 1Choliy VY. On the precision estimates of fundamental planetary ephemerides. Ukrainian. 2014 ;30(6):66-70. 1Protsyuk YI, 1Martynov MV, 1Mazhaev AE, 1Kovylianska OE, 1Protsyuk SV, 2Andruk VM. 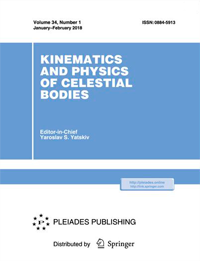 Compilation of catalogues of star coordinates and proper motions using co-processing of archival photographic and modern CCD observations. Russian. 2014 ;30(6):54-65. 1Savanevych VE, 1Briukhovetskyi OB, 2Ivashchenko YM, 3Vavilova IB, 4Bezkrovniy MM, 5Dikov EM, 1Vlasenko VP, 1Sokovikova NS, 1Movsesian YS, 1Dikhtyar MY, et al. Comparative analysis of the positional accuracy of CCD measurements of small solar system bodies by the CoLiTec and "Astrometrica" softwares. Russian. 2015 ;31(6):55-69. 1Sybiriakova ES, 1Shulga OV, 1Vovk VS, 1Kulichenko MO, 1Kozyryev ES. Positional observation of comet by using of combined method. Russian. 2015 ;31(6):47-54. 1Gumerov RI, 2Khamitov IM, 3Hudkova LA, 3Maigurova NV, 3Pinigin GI, 4Kochetova OM, 4Chernetenko YA, 5Aslan Z, 3Pomazan AV, 3Kryuchkovskiy VF. The asteroid observations at Russian-Turkish telescope RTT-150 in 2004-2013. Russian. 2015 ;31(6):32-46. 1Lazorenko PF, 1Karbovsky VL, 2Buromsky MI, 1Svachii LN, 2Kasjan SI. Astrometric catalogue of stars in the equatorial zone, KMAC2. Russian. 2015 ;31(5):61-0. 1Vovk VS, 1Kulichenko MO, 1Kozyryev ES, 1Sybiriakova ES, 1Shulga OV. Observations of small and low elongation near-Earth asteroids. Russian. 2015 ;31(3):73-.